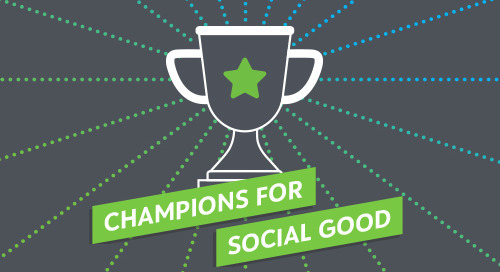 In this episode of the Champions for Social Good podcast, we talk with Aria Finger (@AriaIrene), CEO of DoSomething.org (@DoSomething). DoSomething.org started off as a small grassroots organization and has grown to a “tech-company” style nonprofit that now reaches 5.5 million teens and young adults ages 13-25 in every part of the United States and 130+ countries around the world. With over 300 campaigns for young people to join, DoSomething.org focuses on word-of-mouth, partnerships, and individual campaigns to activate young people to impact a broad range of causes, creating online “communities” of people working toward common goals. Aria explains how DoSomething.org chooses their campaigns, discusses how authenticity plays a key role in predicting what campaigns will do well, and describes a few examples such as their “Give a Spit” campaign with Johnson & Johnson to add people of color to the bone marrow registry to help reduce the racial health disparities for bone marrow transplants. Based on her expertise activating youth around a broad range of causes, Aria advises that companies looking to engage youth flip the question “How can I reach young people?” to “How can I solve a young person’s problem?” Finally, Aria talks about the trends in youth involvement in political issues, and the importance of young people going beyond volunteerism and also getting involved with their local governments to solve problems in their communities.